ComforTask Pneumatic Stool offers a fully padded 20" wide x 18" deep seat for extra comfort and a 16-1/4" wide x 16-3/4" high back contoured for lumbar support. Waterfall front seat edge provides under-thigh support. 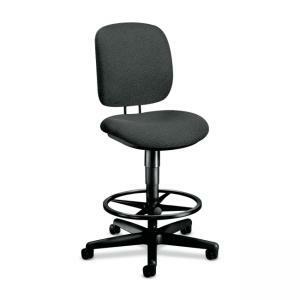 Functions include pneumatic seat-height adjustment from 21-3/4" to 31-7/8" high, manual back-height adjustment and 360-degree swivel. Footring adjusts from 7-1/8" high to 12-3/4" high. Stool is certified by SCS to be in compliance with specific indoor air quality emission requirements and meets or exceeds applicable ANSI/BIFMA standards.